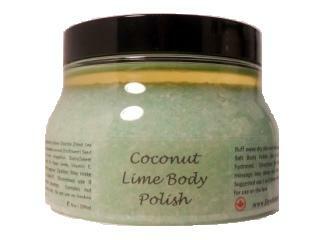 Buff away dry skin with this mouth-watering tropical blend of sweet coconut and tart lime. Skin is left silky smooth, hydrated and glowing. Dead sea salt deeply nourishes, tones and brightens as it removes dead skin cells. Rich in vitamins and essential fatty acids coconut and sweet almond oils feed, replenish, and hydrate for soft and supple skin. Directions: Stir before use and gently massage into damp skin. Rinse and pat dry. Suggested use once or twice a week or as needed. Not intended for use on the face.